← Schools of the Future Look More Like Starbucks…. Dana Middle School piloted a “blended environment” for a 5th grademath class. 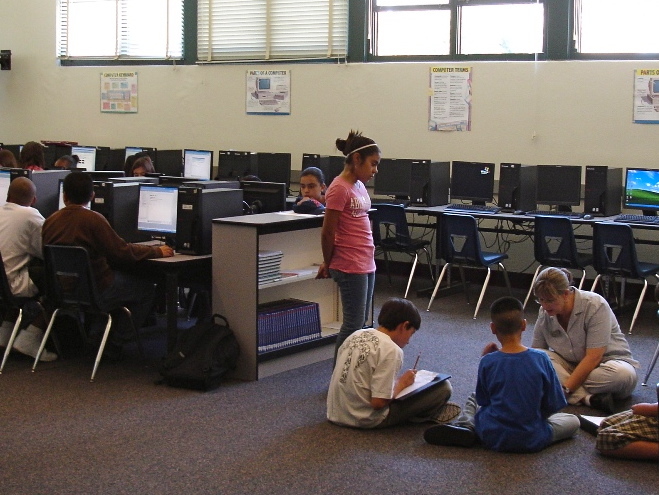 With a physical teacher in the room, the curriculum and assessment was all web based – the provider was Apex Learning. This drastically changed delivery – students moved at their own pace (one was done with the course mid year), the teacher was no longer inventing lesson plans or manually correcting work. The traditional “teacher per student ratio” being replaced by a “time per student ratio” – teachers had more time to spend with students one on one and in small groups. Web enabled curriculum and assessment becomes the enabler for the shift from a traditional teacher centric classroom to student centric classrooms that can pace and personalize learning. Teachers and students have access to real time data to assess progress and optimize remediation. Students can work from anywhere in the always on learning environment. This entry was posted in Transformation and tagged Blended Learning Environments, Online Curriculum, Web Based Curriculum. Bookmark the permalink.